This is the second book by Elizabeth Wein. 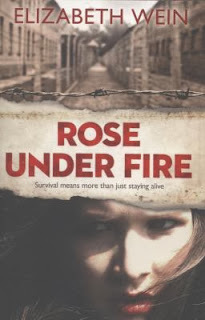 Her first book Code name Verity features some of the characters in Rose under fire though it is not exactly a sequel. Code name Verity was shortlisted for the Centre for Youth Literature's Inky Awards this year. Rose Justice, an Air Transport Auxiliary pilot, is sent to Ravensbruck prison in WWII after she is forced to land her plane in Germany. She forms strong bonds with her fellow prisoners as they struggle to survive in horrific conditions. The one thing that keeps Rose going is the dying wishes of her friends that she "tell the world" and make those responsible accountable for their actions. Can Rose survive and carry out the wishes of so many? Harrowing in parts this is a wonderful story.